Welcome to the National Day Reception celebrating the 69th anniversary of the founding of the People’s Republic of China. Over the past 69 years, China has achieved historic transformations. It has stood up, grown rich, and become strong. This year marks the 40th anniversary of China’s reform and opening up. Over the past 40 years, China has become the world’s largest trading nation in goods and second largest economy, with a significant enhancement in comprehensive national strength and international influence. China’s economic development has reached a new stage. Its GDP has grown from around 368 billion RMB to 82 trillion RMB, contributing to over 30% of world economic growth. We have achieved significant transformations in the domestic economic structure. National economic growth is now powered by a combination of the primary, secondary, and tertiary industries rather than dependent mainly on secondary industry, with the tertiary contributing over 51%. Scientific and technological innovations are flourishing. Major breakthroughs have been made in cutting-edge sectors such as manned spaceflight, quantum science, deep-sea exploration, satellite navigation and high-speed railway. Industrial development is climbing up the value chain. We have built the world’s largest mobile broadband network, with over 800 million internet users. A new all-round open economic structure has just been formed. Trade in goods and outbound FDI stock have reached 4.1 trillion and 1.48 trillion USD respectively. The people’s living standards continue to improve. One fifth of the world’s population are moving from destitution to being moderately well-off. We have lifted 740 million people out of poverty, and increased life expectancy to 76.7 years. A single flower does not make a spring. In the year 2018, China is engaging the world with unprecedented openness, fostering a new type of international relations, and building a community with a shared future for mankind. China is the largest trading partner for over 120 countries and regions, and the second largest source of outbound FDI. China's trade in goods with countries along the Belt and Road routes have exceeded 5 trillion USD, FDI to these countries exceeded 70 billion USD, and created over 240 thousand local jobs. In implementing Xi Jinping Thought on Socialism with Chinese characteristics for a New Era, China is deepening reform and opening up as we mark the 40th anniversary of reform and opening-up, and we have come up with new visions and new proposals, contributing Chinese wisdom and Chinese approach to world peace and development. As the world is currently undergoing profound changes, we are facing unprecedented opportunities and challenges. In advocating and implementing the vision of ‘a community of shared future for mankind’ and proposing joint construction of the Belt and Road Initiative, China is consolidating a consensus on mutual assistance and enhancing international cooperation. The Boao Forum for Asia this April sent out a strong message that China would unswervingly deepen reform and opening up, protect the multilateral system, and promote cooperation between different countries. The Shanghai Cooperation Organization summit in Qingdao this June reached a new consensus and agreed on a new blueprint, marking a new starting point for enhancing security and development. The Forum on China-Africa Cooperation Beijing Summit earlier this month set forth a grand blueprint for China-Africa cooperation with its theme ‘China and Africa: toward an even stronger community with a shared future through win-win cooperation’. Moreover, China will hold its first International Import Expo(CIIE) in November, creating a new platform for partners including Denmark to participate in free trade and development opportunities in China. This year marks the 10th anniversary of China-Denmark Comprehensive Strategic Partnership. Over the past 10 years, we have witnessed ever-deepening political trust, ever-fruitful cooperation, ever-broadening dialogue and exchanges between China and Denmark. Our partnership is now based on solid political relations, the peoples’ support and strong economic ties. This year the two countries have been working closely to implement the China-Denmark Joint Work Program, to actively push forward our cooperation in various fields. Our high-level bilateral visits are ever more frequent. Delegations from Central Government Ministries including the Ministry of Science and Technology, as well as over 20 provinces and municipalities including Beijing, Shanghai and Hainan, have visited Denmark. The Danish Minister for Foreign Affairs, Minister for Employment, Minister for Energy, Utilities and Climate, Minister for Health, Minister for the Environment and Food have paid their visits to China. Tomorrow His Royal Highness Crown Prince Frederik and Minister for Culture and Church Mette Bock will attend the Beijing Design Week. 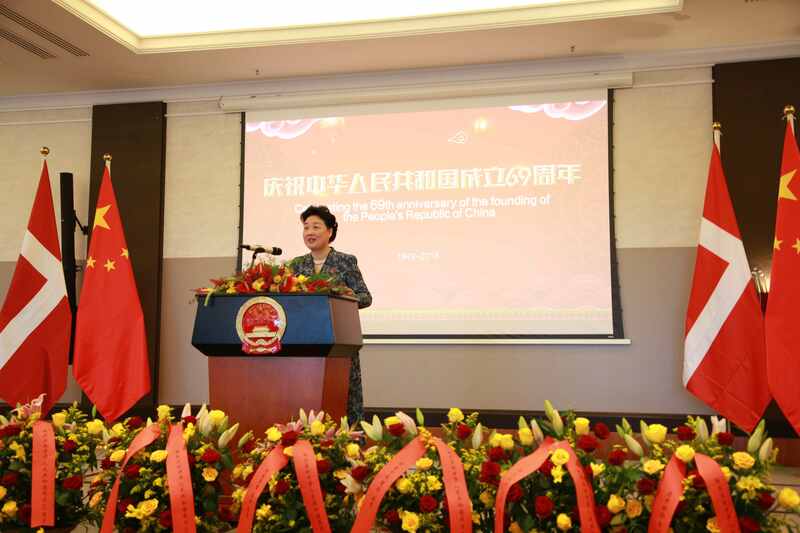 Minister for Development Cooperation Ulla Tørnæs will participate in the 1st China International Import Expo as special representative of Prime Minister Rasmussen in November. In the meanwhile, high level delegations from China will attend the P4G summit and the 18th International Anti-Corruption Conference in Copenhagen in October, further strengthening our dialogue and cooperation in fields such as innovation and entrepreneurship, trade and investment, green development and anti-corruption. Our celebrations of the 10th Anniversary of China-Denmark Comprehensive Strategic Partnership have been extraordinarily brilliant. At the beginning of this year, Chinese lanterns lit up Copenhagen city centre and brought the festivity of Chinese New Year to the cold winter nights here. The Peking Opera version of Hamlet inaugurated the 2018 Shakespeare Festival, and showcased the special charm of combining the artistic forms of the East and the West. Design China -- A special exhibition in Denmark featured contemporary Chinese design, and the Chinese Film Festival enhanced cultural exchanges. The cooperation between our two countries continues to be deepened and put into practice. Bilateral trade enjoys good momentum, with annual trade volume exceeding 10 billion USD in the past 4 years and reaching 7.11 billion USD for the first 7 months this year. Bilateral investment is booming. The stock of Chinese investment in Denmark is nearly 300 million USD, and has created over 1000 jobs locally. Danish investors are enjoying good rides in China. For example, Danfoss’ net profit in China during the first half of the year has increased by 27%, reaching 253 million euro. Cultural and people-to-people exchanges are ever more frequent. The Danish Poet Henrik Nordbrandt won Golden Magnolia Award at Shanghai International Poetry Festival. AirChina, CathayPacific and SAS opened direct flights from Copenhagen to Beijing and Hongkong. Innovation and entrepreneurship, education and research boast great potentials for fruitful cooperation. Until the end of 2017, Danish experts winning Chinese government's Friendship prize totaled 12. And this year, Mr. Joergen Clausen, Chair of Danfoss and Mr. Torben Mogensen from the University of Copenhagen are going to be awarded this prize. Chinese students studying in Denmark now total over 3800, while Danish students in China exceed 1400. The aggregate demand for new joint research and innovation projects stands at 150 million DKK, reflecting the great potential for cooperation. The development of China-Denmark relations speaks for itself. So long as our two sides respect and care for each other’s core interests and concerns, uphold the spirit of seeking the common ground while putting aside differences, and pursue pragmatic cooperation, we will always be able to expand the areas of overlapping interests, enhance consensus in policies and concepts, strengthen complementary cooperation, and push forward our bilateral ties.The China-Denmark Comprehensive Strategic Partnership is now entering its second decade. Both countries are committed to maintaining the multilateral international trade system, so we have a shared language in building a more open international economic order and promoting the development of a more just and fair global governance system. China highly values Denmark’s important role in the Nordic region, the EU as well as in international affairs. We are willing to join hands with our Danish partners in implementing the consensus reached at the 20th China-EU Summit, build a partnership for peace, growth, reform and civilization between China and Europe, while expanding our cooperation on bilateral, regional and global platforms, in order to enrich the China-Denmark Comprehensive Strategic Partnership. to the health and happiness of everyone here today.